← DEATH, DO YOU REALLY KNOW WHAT IT IS? “No hay otras interpretaciones”, there are no other interpretations. The most spectacular “fake news” of Pope Francis’s pontificate is in these four words of the letter he wrote on September 5, 2016 to the bishops of the region of Buenos Aires, in approval of their “Criteria” regarding communion for divorced and remarried persons. There is nothing, in fact, farther from reality than those four words, if one just looks at the variety of contrasting interpretations of “Amoris Laetitia” which by now have free rein in the Catholic Church, between nation and nation, between diocese and diocese, between parish and parish, each of them claiming its own perfect conformity to the crucial eighth chapter of that post-synodal exhortation. It is the conviction of Pope Francis that this variety of positions is only of a “pastoral” nature, without undermining doctrine in the least. Marriage remains indissoluble and adultery can never be justified; and on this the pope does not admit the expression of doubt. But reality says the opposite. Indeed, it is precisely the interpretation of “Amoris Laetitia” presented by the Argentine bishops and made official by Pope Francis that ends up demolishing the Catholic doctrine of marriage. G. Meiattini OSB, “Amoris laetitia? I sacramenti ridotti a morale”, La Fontana di Siloe, Torino, 2018. An excerpt from a chapter of this book is reproduced below. And it highlights the radical overturning of doctrine inherent in the document of the Argentine bishops approved by the pope. The ten “Criteria” promulgated by the bishops of the region of Buenos Aires give guidelines on how to behave in relation to the “situation of some divorced persons who are living in a new union,” without specifying whether the new union is that of a full-fledged civil marriage or a simple cohabitation or a common-law union. And here we are immediately faced with a fundamental imprecision in the text that should dispel the ambiguities of “Amoris Laetitia.” This in fact refers to the “baptized who are divorced and civilly remarried,” and thus to a specific category, while here a person may have gotten divorced from a civil marriage and then again from another sacramental marriage and then find himself in a common-law union, and all the same fall within the range of situations to which the “Criteria” refer for possible access to the sacraments. I emphasize the “can be proposed.” Therefore, continence is not only optional, reduced from demand to proposal, but it is also optional for the priest to present it as such. According to the words of the text, the confessor could also not propose continence, for some unspecified reason, going directly to absolution. The consequences on the practical level are radical. It is possible, in fact, that even the mere attempt to encourage the resolution may be bypassed, without ever being taken into consideration. The question that arises is whether the penitent should at least be made aware that he should try to formulate it, to express if nothing else a beginning of repentance. Otherwise, in the absence of this repentance-resolution, absolution is not valid and the sin remains. Are we sure that doctrine is not changed? This means completely eliminating the repentance-resolution as a condition of absolution. Therefore, after presenting as optional the proposal to make the resolution of continence, the resolution itself is de facto eliminated. Which is perfectly consistent, in this kind of non-theological logic. The statement, finally, that the sacraments of penance and of the Eucharist “will dispose the person to continue the process of maturation and grow with the power of grace,” even without resolution and therefore without repentance, leads me to affirm that these “criteria” do not agree with the teaching of the Council of Trent and the doctrine of the Catechism of the Catholic Church on the sacrament of penance. Also worthy of note is the fact that the word “scandal,” used once in no. 8, refers not to that which is brought about by the faithful living an irregular union, but to the “injustices” that a spouse may have possibly exercised toward the other in bringing about the separation. This is an important point, because in fact it is suggested that Eucharistic communion for these persons can also take place in a manner known to all, not in a confidential way. This statement in fact makes the path of confidentiality optional and therefore allows those who live in clear and objective adultery to approach sacramental communion publicly. Naturally there is no reference to any visible penitential form, however minimal and bland, as for example it is used in Orthodox Churches for those who enter second marriages. It is clear that what is indicated here by the “Criteria” is not the path of the internal forum in the proper sense, which, in the specific case, would require that access to Eucharistic communion take place so as not to cause scandal or confusion in the faithful; that is, not lead them to believe that there is no longer a difference between legitimate union and adultery. The “Criteria,” however, contemplate the possibility of surmounting even this last form of confidentiality for those who live in an objective condition of adultery. Not only that, but they immediately add: “One must not stop accompanying the community to help it grow in a spirit of understanding and acceptance.” The concept is clear: it is the community that needs to be accompanied and converted, it is this that has to get used to welcoming as “normal” these new behaviors, until recently morally and ecclesially unacceptable. 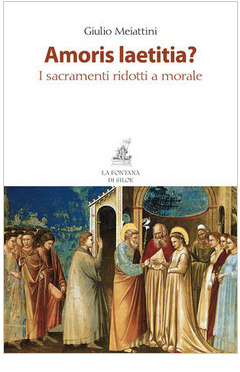 It is hard to deny that a real inversion takes place here: it should not be those who live in a situation of objective scandal who change or receive communion in confidence, after absolution, where their irregular situation is not known, but it is the ecclesial community that must be able not to “scandalize itself” anymore. In this context, the final sentence of no. 9, which urges us to “not create confusion about the Church’s teaching on the indissolubility of marriage,” sounds almost like a misplaced quip. If the praxis admits that those living in an objective union of adultery can approach Eucharistic communion “coram populo,” without even so much beforehand as an ecclesially recognized gesture of repentance for a public sin, the indissolubility and unicity of Christian marriage become a simple ectoplasm. Because it is what is done that matters, not what is said! And the strength of behaviors lies precisely in their shaping and molding thought, feeling, and life. In this case, reality is truly more important than ideas, and the reality is that in common thinking and feeling the practical equation between regular and irregular, between indissoluble marriage and “soluble” marriage will soon be established. There will no longer be any visible marker to distinguish before the community the faithful spouses who approach communion from those adulterers who do the same. And in this habituation devoid of “disagreements” the scandalized reaction, meaning the psychological scandal, may perhaps disappear, and the objective scandal will assert itself: the perception of the normality of public adultery. This is the consequence of an underestimation of the visible and sacramental dimension in favor of a purely moral discernment. More Bergoglian Nonsense! It will fall and the remnant will pick up the pieces and start over the right way with a restoration. Be aware that Bergoglio is a bad man. Humility is well played and calculated to hide the errors of the Bergoglian way.